Before we get to today’s post, don’t forget to join me at 6pm tonight for my very first Twitter Party! Also, don’t forget to enter to win tickets to the Rock & Blues Concert Cruise! I first came across my friends over at Urbivores on Twitter. They blog/tweet about growing their own food, eating (a lot), homebrewing, music, and multiple other subjects…what’s not to like! When I was lining up guest bloggers for this summer, I instantly thought of them! Partly because Ry and I are about to embark on our own homebrewing mission and partly because their blog was new to me, and I was hoping a guest post would introduce my readers to a new-to-them blog as well! They gingerly accepted my invite to guest post about homebrewing to give me some inspiration to get started. Now, I am pretty sure this isn’t a beginners recipe, but I definitely want to work my way up! Enjoy! 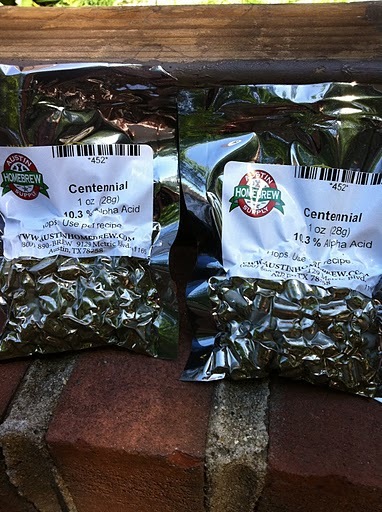 Recently, we brewed a batch of Centennial IPA at the Urbivores’ compound. Here’s the details and somewhat step-by-step walk-through of the process, as well as some notes about why we’re doing things. I will attempt to keep this leaning towards a novice slant – as you get more and more into homebrewing, it becomes increasingly more subjective and scrutinized, so I will stay to the general knowledge. From my experience, you can get as detailed or as vague as you’d like with homebrewing and still come away with a good beer, either way. So first things first, I like to use liquid yeast with my brews, as I’ve found that the difference in taste between a general dry yeast (i.e. 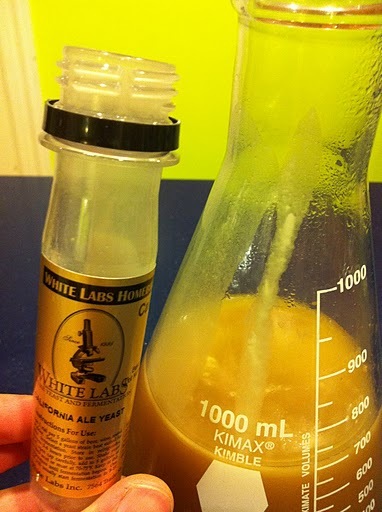 Safale US-05) versus a liquid yeast (in this case, White Labs WLP001) in a somewhat transparent beer like an IPA is enough to keep using liquid. I believe that some will vouch for US-05 doing the same job and having a very similar profile to WLP001, or even being the same yeast, but my palate tells me what it does, and my brain is now tricked into making me a liquid yeast snob (again, the infinite subjectiveness of palate plus details!). 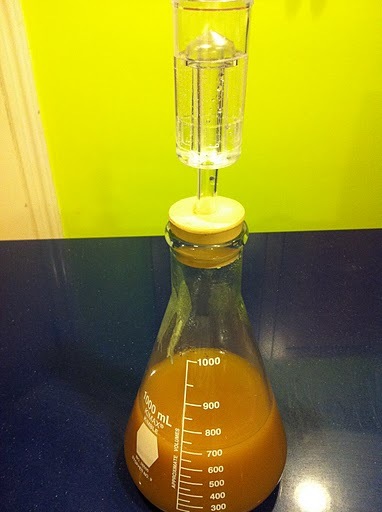 But, for the purposes of illustrating this technique of making a yeast starter, I’m going to discuss WLP001. So I procured my vial of WLP001 from the LHBS (Local HomeBrew Shop/Store) and brought it home the day before I brew, and let it sit out and warm to room temp, over the course of approximately 3-4 hours. If it ends up being 6 or 8 because you’re busy, c’est la vie. As long as your house isn’t 90 degrees inside or the yeast isn’t next to an oven exhaust, you’re cool. When the yeast is at the right temperature, I set out to make the starter. Essentially, you’re making a weak batch of unhopped beer. To do this, I first boiled 3 cups of MWRA tap water for about 2-3 minutes in a clean sauce pot. After boiling for this time, I killed the heat and added 3 oz of dry malt extract (DME) and yeast “nutrient” (some minerals and dead yeast husks, found at LHBS, as well). Also, its a good time to use your trusty brewing thermometer that you *should* have on hand (again, LHBS) and put it in, so it’s sterilized. For the apartment or small space dweller, malt extract is your friend. 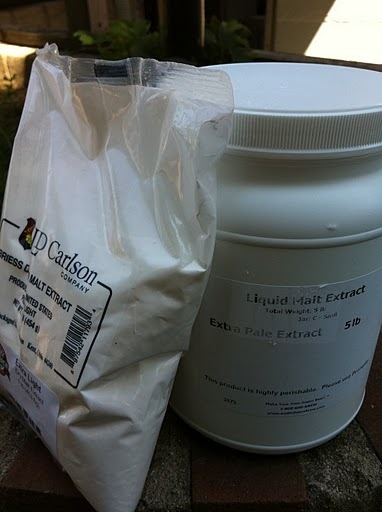 Experienced brewers will advocate making your own extract from grain, but again, for simplicity’s sake and to not scare people, just buy some malt extract and call it even. You want to match the color of the DME to the beer you’re making, so the yeasties get used to chewing on similar sugars. For the IPA, I used extra light DME. For something like a stout or porter, I would start with medium or dark DME. So after adding the DME to the water, return to a boil, carefully, as the sugars will make the pot boil over, akin to a pasta boil unchecked. Once a controlled rolling boil is reached, boil for 2-3 minutes again. Once you’ve boiled for this time, you can either chill the pot or transfer to your yeast growing vessel. I have a 1L erlenmeyer flask that a stopper goes easily on, but I bought this because its all mad scientist looking and I’m a dork like that. You could even use a mason jar if you want, anything that is glass and can stand the thermal shock and then be easily capped with a lid that allows air to escape, but not to come back in. Once the liquid is in the vessel or pot, put the vessel or pot in an ice bath or cool/cold water until the mixture is cooled down to at most 80 degrees F. Ideally, you would like to be room temperature or below, but 80 works for the impatient. Transfer to your yeast growing vessel if you have not already at this point. Once 80 is reached, you can break up the yeast in the vial that you have, but try not to shake it too much, as this will release carbon dioxide in the vial and when you open it, think of a shaken-up soda, except this time, its super yeasty liquid. Once the yeast is uncapped, carefully pour it into your vessel. Try not to spill much outside, as this can contaminate your precious yeast and you might as well not use that. Cooling down the wort, so you can add the yeast. After cooling to 80 degrees, add the yeast. Once the yeast is in the cooled down sugary liquid (wort), use your airlock on the vessel and give it a good shake. This gets some oxygen into the liquid, which the yeast need to convert the sugars to alcohol and CO2. Place this apparatus into a dark cabinet. When you think of it over the course of the next day, when you walk by, take the vessel out and swish it around in there, breaking up the yeast cake in the bottom. After a day of growing, showing the yeast cake at the bottom. Try to get some air mixed in, which will take any available oxygen and mix it in (not much after fermentation starts, really) and give the liquid a chance to release CO2. What you’re trying to do in this case is that you’re trying to grow the yeast to a higher total count for tomorrow’s brew. Since this brew is only going to be approximately 5.5% ABV, I only need to let the yeast grow a day. 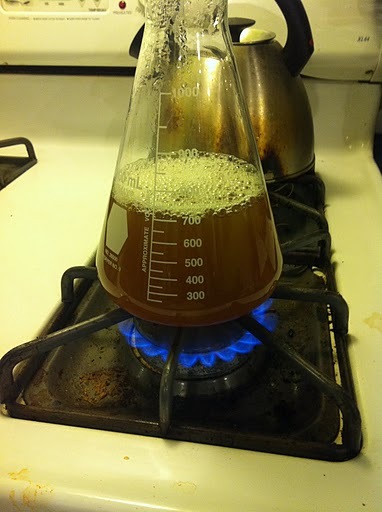 If I were making a larger ABV beer, I would give it two/three days, and possibly make more fresh wort in a bigger container and then put the newly grown yeast into that to make even more yeast. So we’ve got our yeast. It seems like a lot of work prior to the actual brew, and like I said before, it can be as simple as getting your yeast and pitching it when you’ve cooled down your actual brew, straight from the package. I just choose to grow more of it prior to doing that. In terms of the actual brew, here’s what I did, according to a mini-mash type procedure. Using my pot (which is 10 gallons in capacity), I filled up 7 gallons of water. I’m making a 5 gallon batch, but you have to account for a pot boiling for an hour and losing water to the atmosphere. If you were doing this on the stove top, you would fill up your 3-4 gallon stockpot with probably 2.5 gallons of water and then start to heat. My set-up uses an outdoor propane burner (read: turkey fryer burner) for the heat source. The outdoor brew set up. Heat the water with your method to 155 degrees Fahrenheit. Without getting into the actual science (there are various complete books written on the subject), what you would initially need to know is that between the temperatures of 145-155F, this is where the magic of nature happens. This is called “mashing”. As the barley is “malted” at this point, what has been allowed to happen is that the barley grains have been allowed to sprout and grow so slightly, changing the makeup of the barley grain. It so happens that the grains contain enzymes that are activated (alpha- and beta-amylase to be specific) once the growth of the grain has started, and without knowing too much science, this is what early man stumbled upon. These enzymes are what is responsible for breaking down the more complex sugars in the barley (or wheat), so that the yeast can then chew threw them and make the alcohol we’re after. Now before you wrinkle your face up at some evil sounding chemical like alpha- and beta-amylase, please note that amylase is found in human saliva and is one of the reasons you chew corn when making chicha (look this up). So these different enzymes become highly active in this temperature range, and each targets certain types of more complex sugars. So with the mini-mash method, I take a few pounds of milled/crushed barley and put it in a nylon brewing sack and tie the top. I plop this in the pot when the water hits 155 and put the top on. Adding the grain-filled nylon brew-bag to the 155 degree water. The pot I use holds temperature due to the thermal mass of the water in the pot, but if you are using a stove top pot, you might need to return heat to keep it in this range. If the temperature drops below this range, the enzymes stop working, but can work again if the temperature is raised. 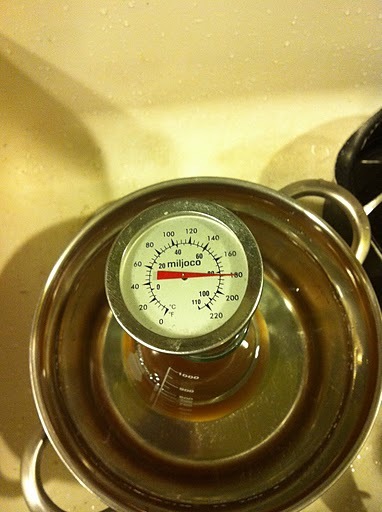 However, above 170F, the enzymes are rendered useless by the heat, so watch going too high on the temperature as well. Serious brewers will note that these mash temps change per style, with generally lighter beers towards the 155F mark and darker beers towards the 145F mark. I let this grain bag do its thing for an hour in the warm water. After the hour, you’ll notice that the water has taken on the color of the grain. I’m specifically not detailing the grains I used, because I feel that is a misleading statement if I do. There are no less than 183 ways to skin an IPA cat when brewing (that’s a made-up number, if you didn’t follow), and your grain bill will vary according to your taste as you brew more. So the technique is what I am detailing here. After about 45 minutes of the hour has passed, heat up approximately 1 quart of water for every 2 lbs of grain you’re using in your mini-mash to 170-175F. Remember what I said about 170F? That the enzymes stop working? Well, that’s what you’re going to attempt to do, you’re going to stop the action. 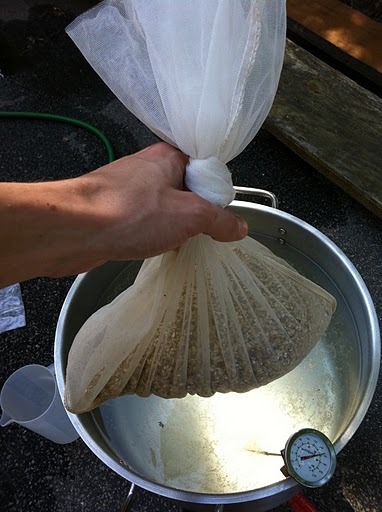 Take the grain bag out of the water at the end of the hour and while suspending it, pour the 170F water over the bag. The technical term for this is called “sparging”. Allow the bag to drip until you’re bored, but do not squeeze the grain. The reason for this is that you can release tannins in the barley that are highly mouth puckering and bitter, but not in a good bitter hop way. Too high of a mash temperature with darker grain can also release tannins as well. 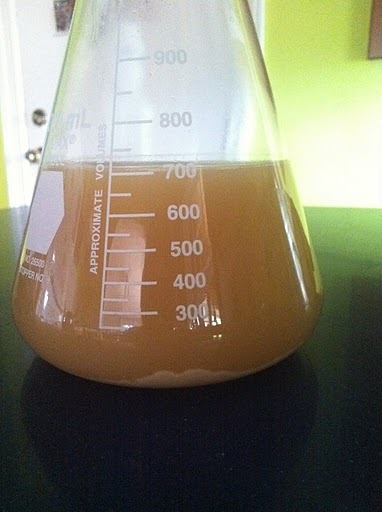 We’re not going to discuss pH at this point, as this is a beginner brew, but it can also create issues with tannins. Ever drink a stout that had a very astringent aftertaste? Yes, you just determined that that professional brewer has a technique issue. Return the heat after your sparge is complete. Continue heating until the pot boils. At this point, cut the heat. For this method, at this point, I add my liquid malt extract and dry malt extract. I use both for this brew for final coloration purposes, while adding the sugars I need for the ABV I’m desiring. Just as during cooking on the stove, our old friend the Maillard Reaction occurs. What this means is that as heat is applied to sugars over time, they become darker (think caramelizing onions or browning skin on chicken). So an IPA is generally light colored at the end of the process… so, in accordance with Beer Judge Certification Program (BJCP) style rules, I want to start with as light colored sugars as I can. These extracts have already undergone the enzymatic conversion at the maltster – they do this step for you and then give you neat, packaged product to use to easily add sugars to your water. Dry and liquid malt extracts. 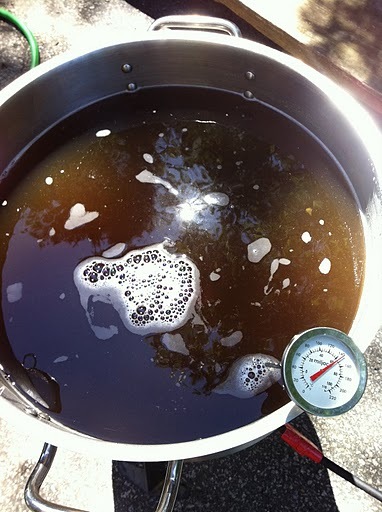 SLIGHTLY TECHNICAL NOTE : Also at this point is the joining point for the three methods homebrewers use to get sugars in the water: all-extract, all-grain, or the hybrid method detailed here, the mini-mash. You can explore the differences of each on your own, but the all-grain will already have the sugars in the water post-sparge, and the all-extract method will put all the sugars in the water at boiling time to reduce the Maillard Reaction effects. Additonally, as you read about the different methods, you’ll find many disparaging comments about extract using brews. You can believe these, but I feel that most of the negatives in terms of using extracts come in tandem with inexperienced brewers using them (as they’re easiest to use) and their technique not being the greatest at the time, and they make a sub-par product and blame it on the extract. I will admit that there are certain tastes with extract versus all-grain beers, but with certain styles, you can avoid these tastes by covering them up. So the reason you’re turning off the heat at boil to add the sugars is due to the risk of boil-over. Think about adding pasta to water… you get a bubbling mess over the pot. This bubbling mess is one you don’t want to deal with… Highly sticky and turns black due to the heat. So – turn the heat off. Once the dry and liquid extracts are in, stir well to dissolve the sugars in the water, return the heat, and watch carefully for boil-over. Once a rolling boil it established, and no boil-over is evident, add your first hop addition (commonly called the “bittering” addition) and start your clock. For this IPA style, I am boiling for 60 minutes. Some styles boil for 90 minutes. Boiling does two major things for us as brewers: 1. it sterilizes the wort/young beer and kills pathogens resident in anything and 2. it leaches the hop oils from the hops to the water and into your beer. The length of the boil has to mainly do with the amount of bittering you are trying to achieve in the beer. For more information, you can visit many of the bittering calculators on the net and research “IBU (International Bittering Unit)”. I put in 1 ounce of Centennial at 10.2% alpha acids at 60 minutes. 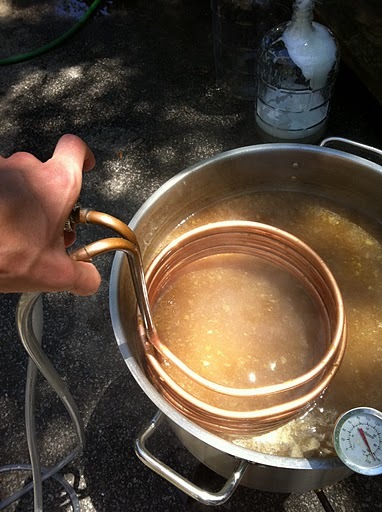 I waited until 15 minutes left in the boil and added a half ounce more, while I dropped in my copper coil wort chiller. The boiling liquid sterilizes the chiller as well. At 5 minutes left, I added the remaining half ounce of Centennial. I used hop pellets here, you can use whole leaf hops, but when you drain, you will lose more liquid to them when you drain into your fermenter. For an IPA, to me, the shift is beginning to be more away from the actual boiled hop additions towards large amounts of adding hops to the fermenter after the first week or so of fermentation. This method is called “dry hopping”. I will follow suit with that beer, as I didn’t add all that many hops to the boil, which contribute IBU’s, but instead, I am looking for the actual hop taste of the Centennial with the dry hopping method, which gives me a nice citrusy taste in the finished product. So once my hour of boiling is complete, I have my copper chiller in the pot, and I turn the flame off and the chilling water on. 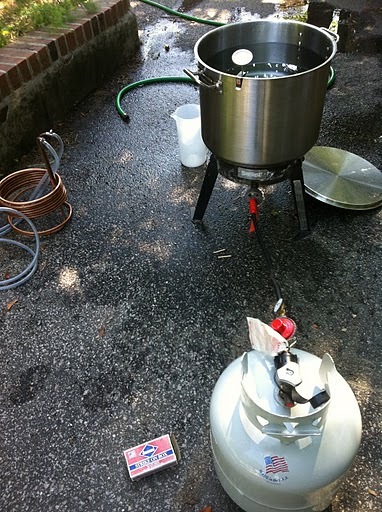 If you make or buy one of these contraptions, you’ll see that they use a lot (somewhere in the neighborhood of 30-35 gallons) of water to cool the wort to a temperature you can then add the yeast to. I stir gently during the cooling to speed up the process, but not too vigorous. The chilling method is up to you – some people make an ice bath in their kitchen sink to cool their pot, blowing through a bunch of ice in the process, some use fancier chillers – but the idea is to get the hot wort down below 100F as fast as you can manage. “Fast” being a relative term, as my chiller takes about 20 minutes to get down there. The 100F mark is too hot to add your yeast, but it does prevent what is called “Hot Side Aeration” from occurring. The actual phenomenon is debated, but in a scientific nutshell, you are trying to shock a large amount of the proteins in the boil out of solution by dropping the temperature. If these proteins are allowed to dissolve into the wort while slowly cooling, they can oxidize and you can end up with a nice soapy flavor in your finished beer you worked so hard for. So chill away, and chill well! Ok, the moment of glory, transfer the cooled wort to your fermenter through a metal strainer. There are not a lot of pictures at this point, because I only have two hands. You’ll catch all the boiled hops, some proteins (called “hot and cold break”) and whatever else fell into your pot during boiling. When pouring into the fermenter, don’t be afraid to splash the wort inside the fermenter. This cools it down a little more towards room temperature, but it also gets some oxygen from the atmosphere into the liquid, which the yeasties need to convert the sugars to CO2 and alkeehol. Some homebrewers actually bubble pure oxygen into the wort to help out, I usually get enough cold aeration to finish all fermentations I attempt. 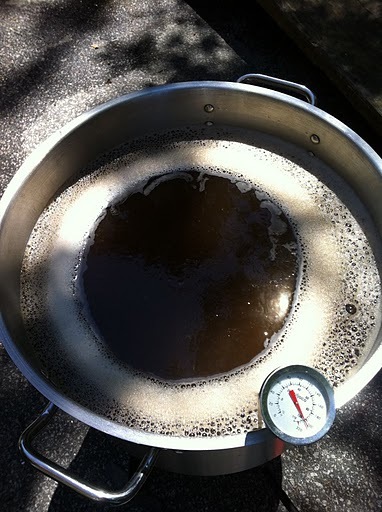 So once all the wort is in the bucket, top up with cold water if you need to to get to 5 or 5.5 gallons total. Once you get there, dump your yeast in, put the airlocked lid on the fermenter, and place in a spot that ideally is around 65-68 degrees F. You’ll start to see the airlock bubble generally within 24 hours. If you added just a vial of liquid yeast, it may take as long as 48 hours. It may also give off some pretty rank smells, depending on the yeast, as well. Let that sit there for a week or two, and then a week before you’re planning on bottling, add 1-3 ounces of hops to the glug. Don’t worry about contamination, as hops are naturally anti-bacterial themselves. I’m not going to get into bottling, as that’s another post altogether. If there’s enough interest, I can certainly get a post on bottling as well! Whew. I feel like I just wrote my life story. Here’s the thing, for everything I’ve written here, there is so much more, and most experienced brewers will find faults with several aspects of this article. And that’s what is absolutely great about homebrewing, especially for over-opinionated people: once something works for you, you can swear its gospel and the right way and tell other people that don’t do it your way that they’re wrong 😉 Hopefully, though, this post might have inspired you to read more about brewing on your own! My Dad used to make homemade beer when I was a kid (I didn’t get to try it, sadly). I’m a little nervous about making it myself, but I applaud you for going for it!